This winning proposal by London-based Foster + Partners and designer Adrien Gardere has been selected from shortlisted entries for an international competition to design the 'Musée de la Romanité' in Narbonne, southern France. Roman artefacts found in the port city will be showcased, featuring ancient relics from the area's archeological sites and legacy of buildings. and temporary exhibitions, multimedia education centre, library, administrative offices and storage facilities. The single storey structure and encompassing concrete roof protects from thermal gain while clerestory windows and light wells introduce dramatic down-lighting. The canopy extends to shelter an outdoor plaza surrounding the museum. Merging french gardens and roman courtyards, the landscaping forms a connection between the water of the Canal du Midi and visitors. An amphitheater hosts displays and events, marking the centre as a landmark and entry point to the city. 'We have been inspired by the setting, by Narbonne’s climate and by the city’s fascinating collection of roman artefacts. 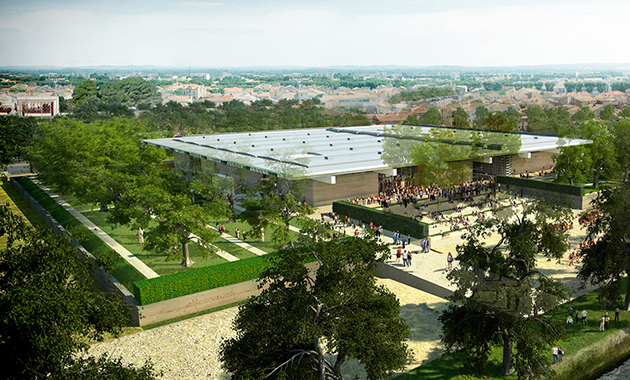 The gardens will strengthen the connection with the canal and surroundings, and at their heart will be a simple, energy efficient museum building. All of the internal and even some external walls can be rearranged – its flexibility mirrors the live excavation site, a shelter to accommodate the exploration within.' - Spencer de Grey, senior partner, head of design at Foster + Partners.